Every once in a while, a wonderful children’s book presents an educational philosophy and becomes a treat for both children and their parents. Louisa May Alcott wrote several books like this (Jack and Jill, Jo’s Boys, Little Men), Dorothy Canfield Fisher gave us Understood Betsy, and now Kirkpatrick Hill presents her ideas in the delightful story of The Year of Miss Agnes. Up in Frederika’s Alaskan town in the 1940’s, the teachers rarely stayed and never, ever came back after the first year. But Miss Agnes was different. She was part of the north, her sinus trouble saved her from smelling the students’ fishy lunches, and she could not be intimidated. And the things she did in the schoolhouse! She boxed up the textbooks, read Robin Hood out loud, hung a map on the wall, and cared for the unteachable. Gradually, the whole community began to stand a little straighter and dream a bit more daringly. Heartwarming but not sentimental, with endearing and realistic characters, The Year of Miss Agnes enthralled Miss 11 and she is rereading it right now. Miss 13, a bit beyond the target age, did not enjoy it much, but I sure did. Beyond enjoying the story, I was validated as a homeschooling mom. I felt a strong pat on the back from Miss Agnes herself, having read Robin Hood out loud several times to my kids. As for other aspects of teaching, well, I learned a few things. Of course, I had to remind myself that this optimistic read is only a story and this teaching philosophy is not as perfect as it seems…but from our own lives I know that much of it does work. 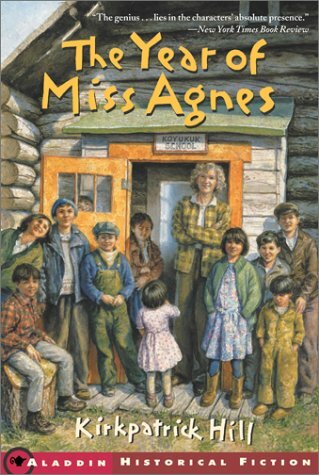 The Year of Miss Agnes is a happy inspiration for homeschooling moms who minimize textbooks, emphasize the classics, and love to read aloud. Written for ages 8-12, this award-winning novel should be available in most libraries. It is a good story on its own (but with a few feminist statements) and is also an excellent supplement for studying the post-war years or Alaska. And, as I said before, it is an inspiration for homeschooling moms. See a picture of the school in 1998, and find more children’s books about Alaska. Disclosure: I borrowed this book from the library and am not compensated for this review. Posted in: 52 Books in 52 Weeks, Homeschool Tips, Reviews, Reviews: Children's Fiction, Reviews: Fiction. I read that years ago to J and should probably read it to Miss K. I remember enjoying it.